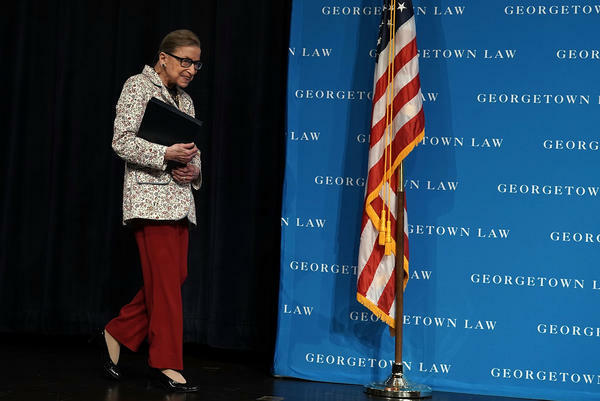 U.S. Supreme Court Justice Ruth Bader Ginsburg arrives at a lecture on Sept. 26 at Georgetown University Law Center in Washington, D.C. Ginsburg has been hospitalized after falling and fracturing several ribs. "Tests showed that she fractured three ribs on her left side and she was admitted for observation and treatment," the statement read. "Updates will be provided as they become available." Ginsburg has broken ribs before and continued to work despite considerable pain. But doctors say fractured ribs are always of considerable concern in an older person because of the danger of pneumonia. Ginsburg is no stranger to illness, even serious illness. She has had two bouts of cancer, one colorectal and the other pancreatic, but she has never missed an argument session on the bench. She was, however, missing from Thursday's investiture ceremony for new Justice Brett Kavanaugh at the Supreme Court. Ginsburg has served on the court for 25 years. For years, the question of her eventual retirement from the court has spurred speculation and sometimes criticism — some Democrats think Ginsburg should have retired during the Obama administration to ensure that her slot on the court would have been filled by a liberal judge. If Ginsburg steps down during the Trump administration, the president will choose another appointee, likely tilting the court further toward the right. But Ginsburg, the court's oldest sitting justice, has consistently been adamant that she has had no intentions of retiring. "I will retire when it's time," Ginsburg told NPR's Nina Totenberg in 2016. "And when is it time? When I can't do the job full-steam." There's precedent for her lengthy service, as Justices Oliver Wendell Holmes Jr. and John Paul Stevens were both 90 when they retired. Ginsburg is more than a legal titan. She has become an improbable pop culture icon and is particularly popular with young women. And because of her age and her fan following among liberals, her health is more closely watched than perhaps any other justice on the court. Her workout routine, featured in a documentary and then in a book, has attracted widespread attention.